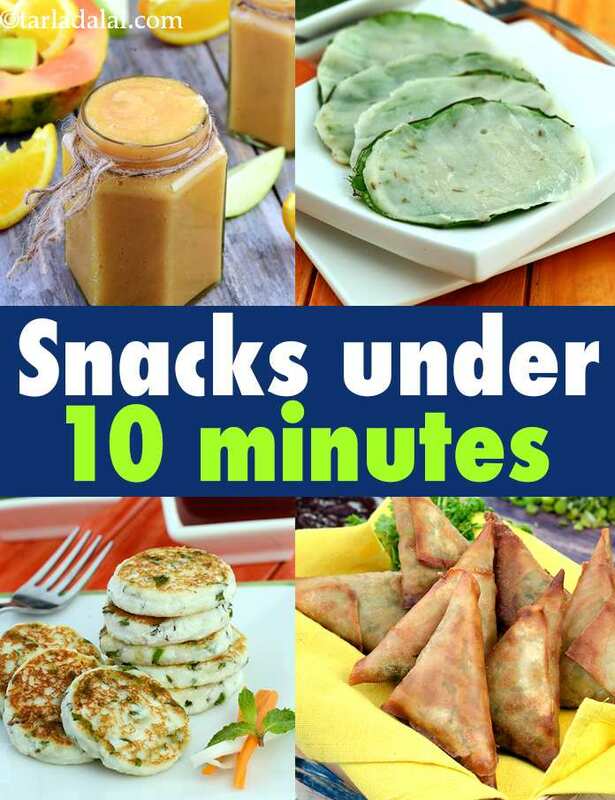 Snacks under 10 minutes recipes. Indian snacks under 10 minutes. Hunger is as unpredictable as the weather. We never know when it will strike – and when it does, it really flusters us. We can hardly wait to sink our teeth into a tasty snack. Well, these recipes will help you with just that. Ready in less than 10 minutes, these tasty and satiating snacks will appease your hunger pangs and keep you full for a while. These are not only handy to answer sudden hunger pangs but even when you need to fix a quick after-school snack for your kids, or when you return home late from work and need to instantly prepare something to feed yourself and your loved ones. The Sevaiyan Upma is one of the most popular quick-fix snacks all over India. It is homely and tasty, and just right to satisfy young and old alike. If you have the luxury of time, you can add a couple of boiled veggies to it, but at the bare minimum go for onions and green chillies to give the Upma a pleasant crunch and tempting flavour. Sandwiches and toasts like the Green Pea and Cucumber Sandwich, and the Cheesy Onion and Chilli Toast, also top the list of quick snacks all over the world. These give a lot of room for innovation, and you can customise your own depending on your taste and the availability of veggies and seasonings at home. In the evening, when you want to relax with your family or friends, with a couple of nice, tasty snacks, go for something quick but awesome like the Quick Cheese Fondue, Nachos with Salsa and Baked Beans or Chilli Bean Dip with Chips. Sizzling Mushrooms is a fabulous snack from the Italian repertoire, which has been made quick, easy and healthy by cooking it on a tava. This tasty treat can be served as a snack, or even as a starter when you have unexpected guests. You can also make something innovative like the Fried Idlis with Curd Dip. Made with common ingredients in a very quick and easy fashion, this unique snack is sure to delight everyone. If you had idlis for breakfast and have a few leftovers, then think no further, this is the right snack for you! Enjoy our Snacks under 10 minutes recipes. Indian snacks under 10 minutes. and other quick recipe articles below. There is nothing like Masaledar Kand for an energizing snack! It is amazing how a sprinkling of common masalas can transform fried kand slices into a snack that tickles the taste buds. Surely it must be the lemon juice that does the trick!